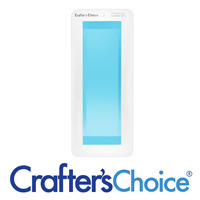 Our Larger Square Loaf soap mold is perfect for large batches when you want to control the thickness of the bar. The bar can be sliced into multiple square shapes. 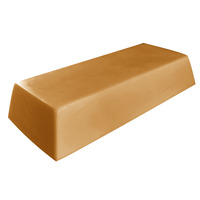 Loaf Dimensions: 16" x 3" x 3"
Bar Depth: 3" Bar Length: 16"
Our Large Round Loaf soap mold is perfect for large batches when you want to control the thickness of the bar. The bar can be sliced into multiple half-moon shapes. Loaf Dimensions: 17" x 4.375" x 2.125"
Bar Depth: 2.125" Bar Length: 17"
Create a honeycomb design on the top of your soap bars with this silicone mold! You can save your bubble wrap for packaging the cute honey inspired soaps you’ll create with this mold. The depth of the honeycomb design is roughly 1/8”. 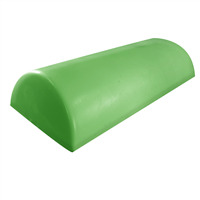 Bar Depth: 2.5" Bar Length: 8"
This is a thick and sturdy silicone loaf mold that weighs nearly 3 lb. on its own. 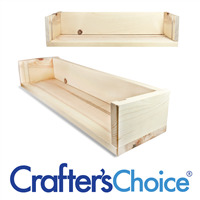 Originally designed to fit as a liner in the Crafter's Choice Wooden Long Loaf Soap Mold, you can use it as a stand alone mold, but will need to support the sides from bowing. The natural color silicone is 1/4" thick on all sides. 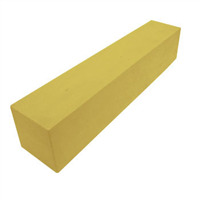 Style: Loaf Bar Depth: 3.125"
Bar Length: 19.9375" Bar Width: 3.125"
Our most popular mold. 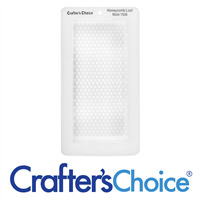 This traditional loaf makes eight one-inch slices of soap, and the loaves will fit in Crafter’s Choice Mitre Box for easier slicing. 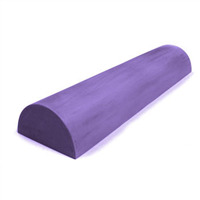 Style: Loaf Bar Depth: 2.5"
Bar Length: 8" Bar Width: 3.5"
Bar Depth: 2.5" Bar Length: 3.5"